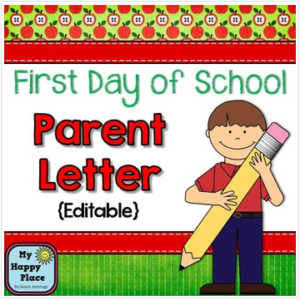 These simple parent letters are designed to help you and your students communicate with their parents about the first day of school. This freebie includes letters for preschool, pre-k, kindergarten, first grade, and second grade. This is an editable PowerPoint document. You must have PowerPoint to use this file. Each page contains two text boxes that you can fill with your own text prior to printing. Alternatively, you can delete the text in the boxes and print the page with no text if you would prefer to hand write your notes. You can choose to prepare these notes in their entirety before the first day of school by filling the text boxes with information about what you have planned and what you want parents to know going forward. If you would prefer, you can type a little note in the bottom text box, but leave the top box empty for your students to fill in at the end of the day. A third option would be to use the bottom box to hand write a quick note about each particular child and how their first day went. You might also be interested in my Beginning of the Year Morning Work! I would love to have you as a follower! Click the green star to be the first to know about new products and freebies!